This is a preview from our new print issue, out next week. Subscribe or renew today, and we’ll make sure you receive it. Elizabeth Warren understands better than most the difference between her and Bernie Sanders. “He’s a socialist,” Warren explains, “and I believe in markets.” She’s a “capitalist to [her] bones,” and Sanders is a democratic socialist. Minor quibbles aside — Warren presumably doesn’t derive most of her income from capital owner-ship, and markets are compatible with socialism — the Massachusetts senator is right. She and Sanders draw their lineage from distinct political traditions. Warren is a regulator at heart who believes that capitalism works well as long as fair competition exists; Sanders is a class-conscious tribune who sees capitalism as fundamentally unjust. Warren frames her most ambitious reforms as bids to make capitalism “accountable”; Sanders pushes legislation called the “Stop BEZOS Act” and denounces ceos for exploiting workers. Warren seeks a harmonious accord between workers and employers; Sanders encourages workers to fight back. Warren’s political tradition is the left edge of middle-class liberalism; Sanders hails from America’s socialist tradition. Or, to put the distinction in more personal terms: Warren is Louis Brandeis, Sanders is Eugene Debs. Though Brandeis and Debs have largely faded from popular memory, both figures were fixtures of early twentieth-century American politics. Popularly known as the “people’s attorney,” Brandeis practiced law from 1878 until 1916, when Woodrow Wilson appointed him as the country’s first Jewish Supreme Court justice. A trenchant legal thinker, ardent in his advocacy for the causes he took up, Brandeis disdained the corruption and monopolies that he saw as harming the public interest. Yet Brandeis was no radical. An inveterate supporter of small businesses, Brandeis saw the reforms he pushed as a prophylactic against socialism. “The law we want to enforce,” Brandeis wrote in 1912 while advising Woodrow Wilson, “is the law of competition.” If businesses had to compete for workers and consumers, if regulation limited the predations of the untoward business-man, all would get a fair deal. Debs, the most prominent member of the Socialist Party of America, understood the revolution that industrial capitalism had wrought very differently. Capitalism had indeed concentrated wealth and power in a few hands. But the solution was to create a “cooperative commonwealth,” where industry would be democratically controlled, and workers would receive the full fruits of their labor. Solidarity, not competition, was Debs’s watchword. Power had to be ripped from the employer class through voting and strikes and class unity. No amount of fair-minded bargaining, no amount of cool reasoning, could close the structural gulf between workers and capitalists. Debs came to this view later in life. As a young trade unionist in Terre Haute, Indiana, he had urged his fellow railroad workers to practice sobriety and become model employees, hoping that conciliation would deliver a bounty. The crucible of class struggle shattered those prescriptions. By the turn of the century he was a committed socialist and industrial unionist. When Debs thundered before rapt crowds — crouched, balding pate tilted forward, hands thrust outward — he spoke with the authority of someone who’d been harassed and imprisoned for leading strikes and preaching the gospel of working-class democracy. But it was his opposition to World War I that would lead to his longest stint in jail. The Socialist Party opposed the United States’ entrance into the war, seeing it as a conflict between competing imperialist powers that would send workers to their graves. Debs, defying the pall of militarism, spoke against the war in the summer of 1918. Fresh off a visit to the local jail, where three antiwar socialists were housed, Debs rose before the crowd in a Canton, Ohio public park. He mocked the idea that the conflict was about democracy and excoriated the “Junkers of Wall Street.” The government detained him. Brandeis — a trusted adviser of Woodrow Wilson even after his Supreme Court appointment — bought the president’s rhetoric about making the world “safe for democracy.” He backed the war. Whereas Debs’s internationalism led him to stand with the German socialists who for decades had opposed the Kaiser’s militarism, Brandeis’s internationalism led him to support Wilson’s war as a means of checking German aggression. Debs forged cross-border solidarity with democratic forces; Brandeis looked to the benevolent power of the emergent American state. When Debs’s case came before the Supreme Court in 1919, the wartime fissure was thrown into sharp relief. Brandeis joined the other judges in upholding the imprisonment of Convict Number 9653. To hear Elizabeth Warren tell it, she arrived at her politics through years of studying US bankruptcy law and being reared in a working-class Oklahoma household. A law professor by trade, Warren discovered in the 1980s and ’90s that record numbers of Americans were plummeting into bankruptcy — not because of their own profligacy, but because of stagnant wages and the rapacious behavior of banks and credit card companies. Year after year, regardless of the economy’s performance, Warren’s figures registered still-higher bankruptcy rates. In 2007 — a few years after an appearance on Dr Phil thrust her into the public spotlight — Warren published an article in Democracy journal making the case for a “Financial Product Safety Commission.” Channeling the ghost of Brandeis, Warren argued that a new agency could cut through the byzantine mountain of lending legalese and shield the ordinary consumer from big-bank chicanery. Bernie Sanders doesn’t see a system knocked off-kilter. He sees a system that exploits workers and devours their dreams. Last July, he convened a town hall that featured five low-wage workers detailing their nightmarish jobs: long hours, poverty wages, imperious bosses. Framing the problem as one of “ceos versus workers,” Sanders lamented an economic system that treats humans as “disposable.” He frequently uses his prodigious social media presence to amplify, and express solidarity with, working-class struggles. If Warren’s law-professor background birthed her reform liberalism, Sanders’s early experiences spawned his democratic socialism. Born in Brooklyn to working-class immigrant parents, Sanders joined the Young People’s Socialist League (YPSL) in college in the 1960s. The organization, Sanders explained in a 2016 interview, “helped me put two and two together.” Poverty, war, and racism were all around him. But what was their cause? YPSL — the youth affiliate of Debs’s old Socialist Party — blamed an economic order that piled on advantages for those at the top and pitted workers of all races and nations against each other. Following a string of failed third-party candidacies — and a stint producing educational material, including a laudatory documentary about Eugene Debs — Sanders took office as mayor of Burlington, Vermont in 1981. Sanders tried to boost working-class participation locally and foster solidarity and peace internationally. He visited revolutionary Nicaragua, convinced the city council to establish a sister-city program with Puerto Cabezas (a Nicaraguan city governed by the Sandinistas), and brought Noam Chomsky to city hall to speak on US foreign policy. Voter turnout skyrocketed. Sanders’s most recent book is a testament to how little he’s drifted from that vision of working-class solidarity. It finds him criticizing the idea that America should exercise “benevolent global hegemony,” deploring the country’s “one-party foreign policy,” and casting Trump’s criminal neglect of post-hurricane Puerto Rico as the latest episode in a “long history of colonialism and exploitation.” It lists a litany of interventionist crimes: the overthrow of Mohammad Mossadegh in 1953, the coup against Salvador Allende in 1973, the “support [for] murderous regimes in El Salvador and Guatemala” in the 1980s. The alternative today? A “global progressive movement” that can challenge metastasizing authoritarianism. Insofar as Warren takes issue with US foreign policy, the foibles are of more recent vintage. After the fall of the Soviet Union, she writes in her Foreign Affairs essay, the US became mired in “endless wars” and “began to export a particular brand of capitalism” that favored wealthy elites. She doesn’t prescribe belligerence in its place. But she looks to a strong American state to bring prosperity to the world and balance the influence of Russia and China. 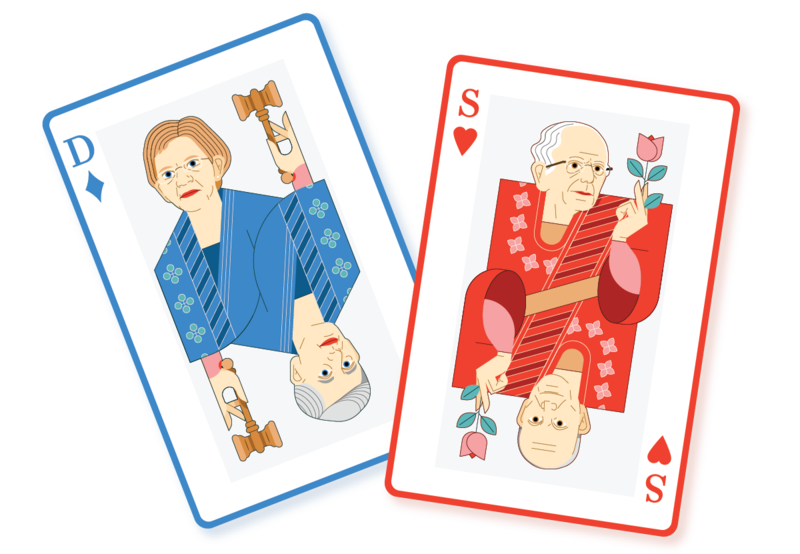 Sanders and Warren both hold positions that are seemingly at odds with their respective political traditions. Sanders wants to break up the big banks, not nationalize them; Warren has introduced a bill that would establish a government producer of generic drugs. Even if some of these deviations are explainable (Sanders would likely advocate more sweeping socialization in a more favorable political climate, and Warren couches her generic-drug bill in the language of competition), neither fits the ideological bill to a T.
So why even try to slot Sanders and Warren into political traditions? Isn’t this an esoteric exercise of the academic, the tic of the compulsive taxonomist? The short answer is that political figures and thinkers are more than the sum of their assorted policy positions. They have distinct, historically grounded worldviews that, once revealed, can both give us a better handle on their core beliefs and predict how they might act in shifting circumstances. Imagine: President Sanders is sitting in the Oval Office, and the streets are thronged with climate change protesters. No longer is a steep carbon tax the most radical policy on offer — nationalizing fossil fuel companies has crept into the mainstream discussion. All things equal, we could expect Sanders to not just slide into the political space opened up, but to agitate for its further expansion — to barnstorm around the country for transformative action, urging the movement on. A President Warren would certainly favor climate change legislation. But given her political proclivities, we could expect her to be less willing to galvanize a mass movement. While Warren is a principled anti-corporate voice in a party that still swims in Wall Street cash — and she’ll be an important part of any left movement going forward — her politics suffer from the same descriptive and prescriptive flaws as Brandeis’s. For all its erudition, the middle-class liberalism of Brandeis and Warren is hamstrung by an idealism that employers can be enlightened, capitalism can be rendered democratic, and American power can be harnessed for progressive ends. Brandeis’s view gained more purchase one hundred years ago. We’d be better off if Debs’s did today.